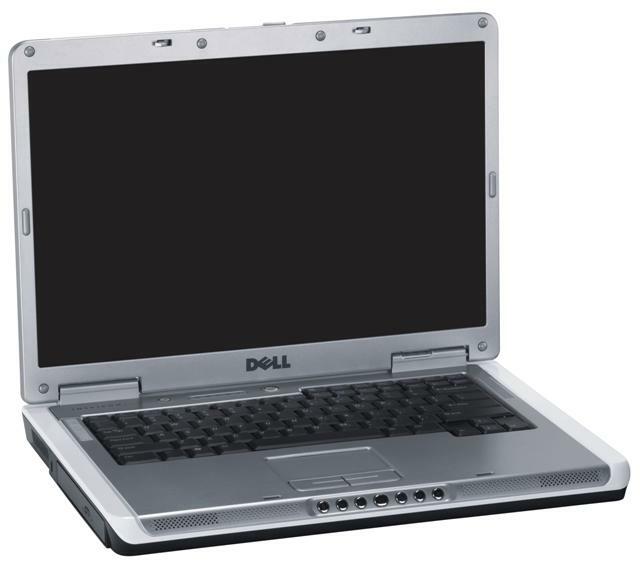 The middle child in Dell's line of basic home laptops, the Inspiron E1505, launched on May 9th 2006, makes a good home or small-business system if it stays put most of the time, as it's too heavy for regular travel. With the Inspiron E1505, all of the crucial elements are accounted for: you get a comfortable keyboard and touch pad, a decent display, and a very solid collection of basic multimedia features and connections. The base unit starts at approximately $700, but Dell offers a vast array of configuration options for everyone from the most basic Web and e-mail user to digital junkies who require midrange gaming and graphics capabilities. That said, if you're looking for a similar set of features but a larger display, check out the Inspiron E1705; if you're looking for something more portable, the Inspiron E1405 weighs a pound less and offers a similar experience, just with a nominally smaller display. HP also makes two systems, the Pavilion dv5000 and the Compaq Presario V5000, which offer comparable feature sets, weigh a little less, and often start at lower price points (depending on promotions and coupons). Measuring about 14 inches wide, 10.5 inches deep, and 1.5 inches thick, and weighing 6.9 pounds (or 8.2 pounds, with its considerable AC power brick), the Inspiron E1505 is too large and heavy for regular travel. Skirting the line between midsize and desktop replacement, it joins the legion of other low-priced 15.4-inch wide-screen laptops on the market, including the Gateway NX500X and the aforementioned HP models. The Inspiron E1505's 15.4-inch wide-screen display can be configured with one of two native resolutions, XGA or the finer SXGA+, and either a glossy TrueLife or standard, nonglossy finish. We prefer the finer resolution, which affords more screen real estate, but if you have bad eyesight, the lower resolution will make text and graphics appear larger, though less detailed. The glossy finish makes the display look brighter but also gives off a distracting glare in sunny or well-lit environments. Our glossy, SXGA+ test unit delivered a solid score of 160cd/m² on our Minolta luminance meter, which tests a display's maximum brightness. The Inspiron E1505's keyboard is adequate, and the touch pad and two mouse buttons are nice and big, though they don't afford a great amount of tactile feedback. The Inspiron E1505 offers a standard array of ports and connections that should fulfill the needs of most basic users. 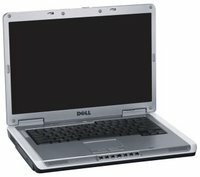 The offering is virtually identical to what you'll find on the Pavilion dv4000, except that the Inspiron E1505 lacks a Type II PC Card slot (inconsequential, unless you already have a bunch of PC Cards) and has a media card reader that supports one additional format (SmartMedia). One of the very best things about the Inspiron E1505 is the set of seven handy multimedia buttons that sit smack in the middle of its front edge, which makes it easy to control music and movies, even when the lid is shut; no other vendor offers controls as simple and as good. Also onboard is Dell's MediaDirect software, which can play CDs and DVDs and access other digital media on the hard drive whether or not Windows is booted. The two speakers placed along the front edge deliver sound that's crisp and clear but lacking in bass. Our top-of-the-line $2,300 Inspiron E1505 came preloaded with Windows XP Media Center Edition and a premium set of components, including a 2.0GHz Intel Core Duo T2500 processor, 2GB of DDR2 RAM (2 DIMM), a midrange ATI Mobility Radeon X1400 GPU with 256MB of video RAM, a big 120GB 5,400rpm hard drive, a dual-layer DVD burner, and a three-year warranty. Our Inspiron E1505 delivered performance that wasn't that much faster than a number of less expensive, somewhat less well-configured laptops, including the Lenovo 3000 N100, the Toshiba Satellite P105-S921, and Dell's own Latitude D520; we're skeptical that the Inspiron E1505's premium configuration is worth the investment. That said, the Inspiron E1505's base configuration, which should do the trick for basic home users who just want to surf the Web and send e-mail, starts at about $700 and includes a decent lineup: a 1.66GHz Intel Core Solo T1300 processor; integrated Intel graphics; Windows XP Media Center; 512MB of RAM; a 60GB 5,400rpm hard drive; a multiformat DVD burner; 802.11a/g wireless; and a six-cell battery. We'd advise more ambitious users to shell out the $150 or so for the higher resolution display, a 100GB drive, and 1GB of RAM. With a big, nine-cell battery (an $80 upgrade), our Inspiron E1505 fared well in our drain tests, lasting just short of 5 hours; still, battery life shouldn't be a huge consideration for a laptop that's not particularly portable. Dell backs the Inspiron E1505 with an industry-standard one-year, mail-in warranty on parts and labor; upgrading to three years of warranty protection costs less than $200, which is a solid value. Toll-free telephone support lasts for just a year. The best part of Dell's support Web site is the customer forum, where users can go to get help from other Inspiron owners and Dell reps who moderate the discussions. Otherwise, the site offers the typical knowledge base and download sections.